A reminder that entries close on Friday 7th October at 5pm, in case anyone has been training hard for this classic event which starts on 22 October. The potholes in the main driveway have been repaired. I am asking everyone to drive more slowly on that road. The speed limit is 15 kph. The relentless rain has not helped the other road or Graham's plans to try and repair it and it seems there is more in store. When we were visited by Ben Loiacono from the Hills Shire Council last month, we brought up the subject of waste disposal. Ben said he would ask Cleanaway, the council contractors, if they would provide us with a skip. A skip is the ideal solution because of its large capacity. When it needs emptying all it takes is a phone call to the contractor. This is the solution that Cleanaway provides for all the other Parks along the road to Wisemans Ferry. 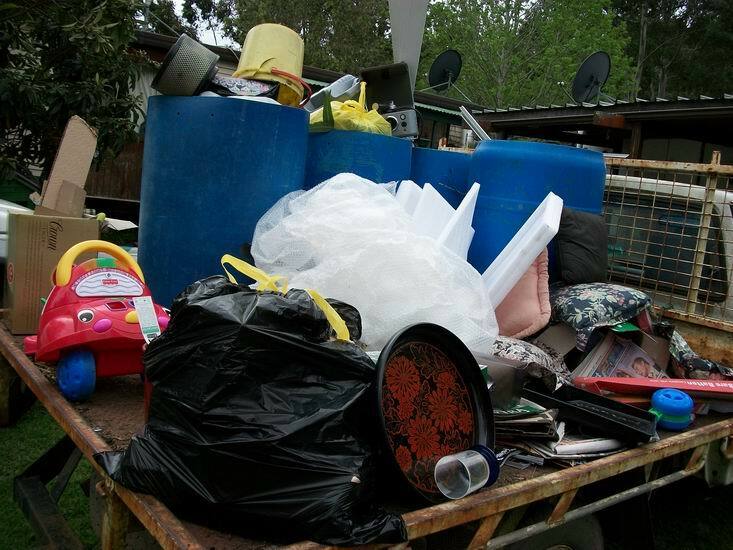 We have tried many times to get a skip and even some of our customers have tried to help but to no avail. We even had a Cleanaway rep come down to assess the road and see why their drivers wouldn't come this far. At one stage we were told that the drivers refused because they could not negotiate an overhanging rock in the road. That does not seem to be the case now, but Ben was told by Cleanaway that they will not provide a skip this far down the road. That was a great disappointment to say the least as we thought the council would have had some clout that we don't have. As you might have guessed attempts to find a contractor other than Cleanaway have so far been futile as no other contractor will cover this area because it is in the area allocated to Cleanaway. The other possibility we discussed with Ben was to have extra bins during the busy seasons, such as long weekends, Christmas and Easter, when extra bins would handle the excess garbage. You would think this would be an obvious and straightforward solution and Ben was clearly under the impression that we could just order the extra bins needed during those periods. Cleanaway have consistently refused us in the past, saying that if we want extra bins we have to have them through the whole of the contract period and pay for them regardless. That is truly wasteful and simply not manageable, cost-wise. We were very pleased with Ben's offer to make the enquiries on our behalf, unfortunately he did not have any more success than we have and suggested that we contact the council waste management senior coordinator to see if there are other alternatives. So, a double disappointment and no cost-effective solution in sight at the moment. The site fees are due between 1st and 14th October. Everyone was sent an annual invoice around mid-June for the whole of this contract year. However if you can't find it or there has been a change in your circumstances just let me know by email and I will send you another invoice. The electricity invoices will be sent toward the latter part of this month. I hope to have the total Origin/Integral electricity bill before the meters are read and the bills sent out this time as we always seem to be just out of step with them. I ask everyone to remember that we are only responsible to dispose of a reasonable amount of household garbage for each site. We are really not responsible to dispose of your old pillows and sheets, shoes, clothing, masses of plastic wrap, foam, big cardboard boxes, old toasters, coffee machines and so on which were stuffed into the garbage bins this weekend. You or your neighbours and visitors can not generate excessive garbage like this without overflowing the bins and affecting everyone else on the Park. Clearing out all your old household goods is not a "reasonable amount of household garbage". Year after year we have had the extra council cleanups and we circulate this information to everyone on the Park. That is how to dispose of unwanted goods, either by waiting until the council pickup to do your spring cleaning or by taking unwanted things home, not by sabotaging the bin system and then targeting management. We did manage to dispose of a lot of the extra garbage on Tuesday morning with the usual council pickup. Unfortunately however what you can see here could not fit in the bins because kitchen waste and other decomposing garbage had to take precedence, so we had to pull it out of the bins and dump it onto the back of the truck. The four blue barrels and black plastic bag are choc-full of clothes and other household items that couldn't fit in the council pickup bins. This is only a fraction of what is dumped on the Park each season. We cope with beds, stoves, old BBQs, unwanted lounges, appliances and all manner of items big and small. You start to wonder where your life went when what you really want for Christmas is a garbage skip! We can only do what we are already doing, which is disposing of the extra garbage slowly over a period of time after the busiest periods. Meanwhile I shall keep everyone posted when the next council pickup is scheduled.